DC Mike Nolan is Dolphins "biggest offseason acquisition'"
Post subject: DC Mike Nolan is Dolphins "biggest offseason acquisition'"
With the Dolphins back on the practice field, cornerback Will Allen says ``everybody is excited'' about new coordinator Mike Nolan's defense. Post subject: Re: DC Mike Nolan is Dolphins "biggest offseason acquisition'"
Certainly getting Mike Nolan was a huge get for Miami. I'm very anxious to see the defense with him in charge. Agreed. Was more excited about his signing than anyone else. Has the ability to turn around an entire side of the ball - not just one position. I said it at the time, whether or not we got Dansby or Marshall (course we ended up getting both;p), Nolan would be our best addition. I think he's going to transform our defense into a contender. Maybe not this year, but in the very near future. I agree Mike Nolan was a fantastic hire, and I was ecstatic that he magically became available. However, Brandon Marshall instantly makes this offense great. I was hoping all during last year that McDaniels would fight with him so Marshall could go and Miami could get him...and it happened. He's a Dolphins. One of the top 5 receivers in the NFL is a Dolphin. I can understand the argument with Nolan being the biggest acquisition, but if that's the case, I think Marshall is tied with him. Otherwise, Marshall is the biggest. The guy is a beast. 15 TD's for him this season. Write it down. I don't think you can say Marshall "instantly makes the offense *great*" when he has yet to step on the field and we have not seen how the other receivers will adjust to him. He SHOULD make the offense great...or he may just have an impact on the receiving corps. I think with Nolan you are dealing with someone who has his hands in a variety of positions and, on top of that, he is a terrific game planner defensively. When breaking it down, Nolan has the *potential* to have a greater impact, IMO. Either way, we're arguing over nothing...because it is basically 1a and 1b. As long as we agree Dansby is third. I think the most telling thing is that we got rid of people who were a harm to the team and replaced them with people who have proven their worth. Pasqualoni's defenses were very basic and easy to pick apart, so we got rid of him and brought in Nolan, who is on hell of a DC. Ginn was dropping crucial passes and even causing turnovers, so we trade him and bring in a top 5 WR. Ayodele was pretty bad in space and always missed tackles, so we brought in the top LB on the market. If we get FS figured out I would say this is the best offseason possibly in Dolphin history. I don't think you can say Marshall "instantly makes the offense *great*" when he has yet to step on the field and we have not seen how the other receivers will adjust to him. This doesn't make sense. The title of the thread involves speculation, so my justification is speculation as well. I most certainly can say that if others believe that Nolan is the "biggest offseason acquisition" when he haven't even called a play yet. I wasn't concerned with the title of the thread - just what you said. I am hopeful that Marshall will be the spark the offense needs, too, but I'm not going to say our offense is "great" until I can see it perform in unison. His average defense finishes around #14 or so, a ten position upgrade over what we have had the last two season, the 08 defense wasn't great, but it managed to come up with red zone stops, which made it seem better than it was. I do think Brandon Marshall was the largest offseason acquisition, I think Nolan was the most important hire since Will Muschamp, and he is walking into a situation with a core on defense that is entering their #2-#5 seasons. Langford, Wake, Davis, Smith, Starks (as a starter) so if anything he has more to work with in Miami than he had in Denver minus Champ Bailey. 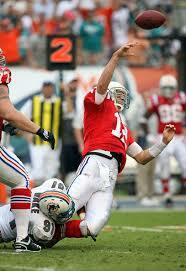 Dolfans have every reason to be hyped about the 2010 season, if we add Atgowe, even more so. I wasn't concerned with the title of the thread - just what you said. Again, that doesn't make sense. How can you be concerned with that, when the title of the thread has already deemed Mike Nolan the biggest offseason acquisition? You just might as well say that nobody can be decided the best acquisition "until I see them play." Otherwise, your argument holds no merit. Sounds like Omar has been listening to The Who's "Won't Get Fooled Again". I can understand. I was disappointed at what Capers put together, but at the same time I think that team had tuned out to our coaching staff. Can’t help but think I’ve heard this “we’ll make offenses adjust to us” song and dance new defensive coordinator Mike Nolan is preaching before. Dom Capers said it. Paul Pasqualoni said it, and both ended up playing follow the offense. What will make Nolan’s unit any different? It certainly looked like the exact same defense I saw last season, maybe with a little bit more inside linebacker blitzing. I will wait and see how well the D plays this year before I say he was the biggest offseason move.....??? No, sir, what you are saying makes no sense. My comment was in direct reply to you saying Marshall would make the offense "great." Put that in a box outside of the title of this thread. I already made the concession that nothing could be said for sure until we see what happens on the field. Your trying to string this argument along is ridiculous at this point. Calm down. I'm done.